Otherworldly is the word for India. At least it is if you are a middle class white girl who grew up in western Pennsylvania. Which is what I am. 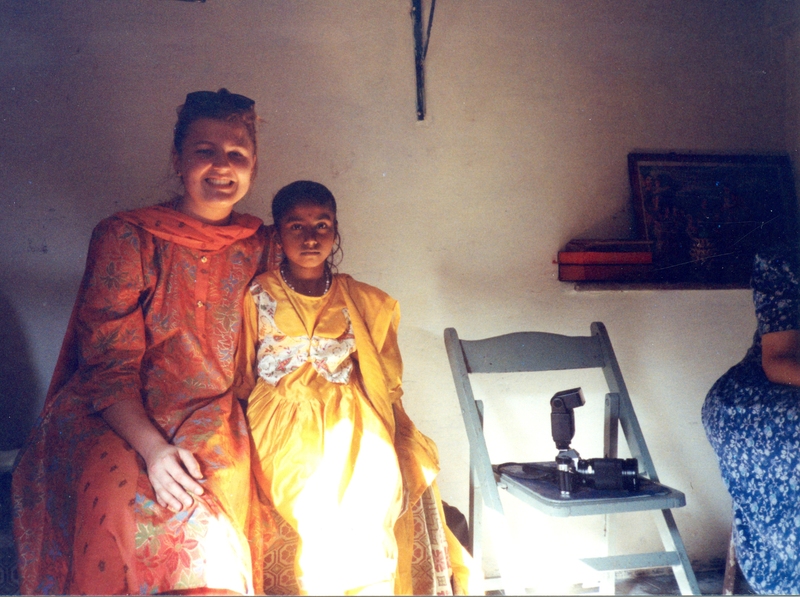 The slums of Mumbai and the bovine-scooter-crowded streets of Khammam were my introduction to the Global Village experience. Building houses in India was nothing short of transforming. And this is what I learned. If you can regard with affection the relentless smell of petrol-dung-body-odor, the taste of hot spicy food in 95 degree heat, the sight of the maimed and the sound of constant motion, I believe you are the rare breed who rather enjoys sliding down the razor’s edge of life. Me too. Her name was Lenuka. As she handed me a tiny cup of steaming chai in the stifling heat, I had never felt so unworthy. We were from different worlds. She was a child of 11, I a young woman of 22. She was a dark-haired brown-eyed beauty. I was a giant of a woman in her country and a pale long-locked blonde at that. She spoke Marathi. My language was English. And yet, through quiet gesticulation and slow pronunciation accompanied by a lot of laughter, we found a way to communicate. She sat close to me and I can still remember the sweet smell of spices and oil in her hair. I enjoyed the pleasure of Lenuka’s company while building Habitat homes in Thane, a crowded slum outside the Indian city then called Bombay. The “streets” were a barely navigable maze of raised earth that formed narrow walkways. In order to enter a home one needed to walk a short plank to cross the threshold and avoid falling into the surrounding moat that acted as the slum’s sewer system. Lenuka’s new Habitat home would have a concrete floor, a separate second-story sleeping area, walls made of brick and mortar and a metal roof. Her new home would be a safe place for her family to live, where insects could not nest and monsoons could not destroy. At the end our week of daily journeys via public train to Lenuka’s village it was time for the house dedication ceremony. This event was treated with all the typical Pantone colored pageantry you’d expect of an Indian wedding. Our team, clad in the traditional saree, or salwar and kameez, or kurta, were draped in handmade garlands of fresh sweet-smelling flowers. There were ribbon cuttings, stirring speeches, melodic music, gifts given and plenty of sweets and chai – ubiquitous chia for all! Except that I almost didn’t make it to the ceremony. Somehow I lost site of the group and found myself alone in a labyrinth I had absolutely no chance of navigating. Unsure of how to solve my dilemma and just when panic might have set in, she came from behind. In the instant it took for Lenuka to slip her little hand into mine and lead me, I felt overwhelmed with relief and overjoyed at the comfort of being known. She had rescued me. And all the while I thought I was the one doing the rescuing. That’s the irony of volunteering with Global Village. You go to give and somehow you get more in return. Building in city of Thane outside of Mumbai.